A great addition to any bedroom this six drawer dresser provides plenty of storage space for clothes and other items. 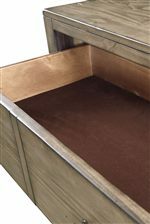 The two top drawers are lined with felt which allows you to store your valuable items without having them get scratched or damaged. 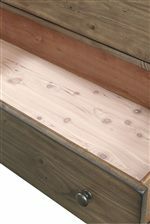 The cedar-lined bottom drawers will keep your out of season items free of damage from moths or moisture. Easily pair it with a mirror to allow more light in the room or place your TV on top and enjoy a movie in bed. 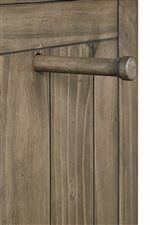 Constructed of solid pine and paneled sides combined with the antique bronze hardware add a rustic look to the piece. The Tildon Six Drawer Dresser with Paneled Sides by Aspenhome at Walker's Furniture in the Spokane, Kennewick, Tri-Cities, Wenatchee, Coeur D’Alene, Yakima, Walla Walla, Umatilla, Moses Lake area. Product availability may vary. Contact us for the most current availability on this product. Create a tranquil atmosphere in your home with the Tildon collection. 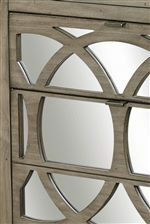 Common features in this collection include antiqued bronze hardware, glass doors or table tops designed with trellis fretwork, wood paneling and solid pine wood covered with a mink finish. 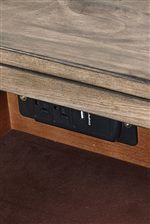 A variety of storage options along with modern twists such as 3-way touch pathway lighting, AC/HDMI/USB outlets, and lamp-assist touch lighting allow for full convenience in your home. 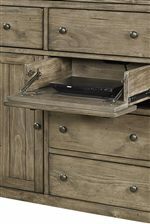 The clean lines of this collection hint at a contemporary style that pairs well with the distressed rustic wood to give a homey feel. 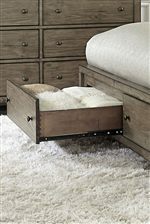 The Tildon collection is a great option if you are looking for Rustic Contemporary furniture in the Spokane, Kennewick, Tri-Cities, Wenatchee, Coeur D’Alene, Yakima, Walla Walla, Umatilla, Moses Lake area. Browse other items in the Tildon collection from Walker's Furniture in the Spokane, Kennewick, Tri-Cities, Wenatchee, Coeur D’Alene, Yakima, Walla Walla, Umatilla, Moses Lake area.